Synopsis : ‘Her Resurrection’ bravely paints an appalling picture of the society. Heartbreaking, hopeful and immensely healing at the same time, this emotional rollercoaster through dreams, tragedy and triumph is a moving tribute to womankind. Are you ready to embark on a transformational journey with Maya? My view : Before I begin expressing my opinion, I would like to thank the author for bringing this tale of woe and suffering to the eyes of readers like us. If he wouldn’t have taken the pain of writing the story of an oppressed woman in the society then many of us would have still continued living in the comforts of our house with no gratefulness or indifference towards those who are less fortunate than us. Awareness is a very important aspect of fighting with any evil. And the evil against women has been continuing since time immemorial. Yet every step against this evil has helped humanity move a step forward towards the utopia of Gender Equality. 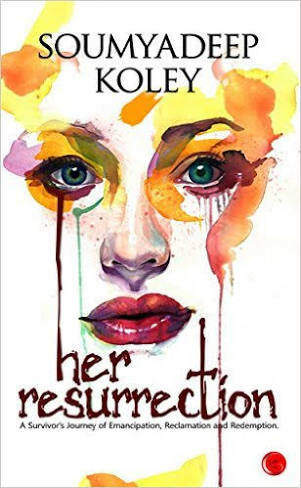 Soumyadeep Koley’s book Her Resurrection is one of those steps that was needed in the current times. The life of a girl named Maya (means Illusion) living in a small village has been painful throughout. Her childhood was traumatic marked with child abuse, sexual exploitation and her own father’s murderous attitude towards her. She grows up to be abused further by all the men she comes across. Raped, beaten, wrongly utilized by many, she even has to live as a prostitute in a bordello of Mumbai. It might seem unreal to many that a person receives so much pain in their life but there are many Mayas throughout the rural areas of India (as well as other countries) who are facing the brunt of patriarchal society each day. It is rightly said in the book that ‘everyone’s life is a tragedy’. Therefore we can relate to others who have been humiliated and tormented by the demons of life and empathize with their sorrows. This book is an Eye-opener to many who think that today’s women are privileged. They are not. Years of being crucified under the pioneers of patriarchal society has rendered them maimed and broken and there are many women who are yet to face the light of progression. Other than the typing and grammatical errors that could have been corrected in the editing stage, I found no faults in this novel. What I found really fascinating about the book was how well the author has portrayed the voice of a female. There were times when I forgot it was the author who was telling us the story, I kept reliving the life of Maya. It was like watching her life unfold in front of my eyes. The characters were well outlined and developed, be it Saadia, Dr. Ramasubban, Siddhartha or Damien. They were strong and real, and had their own flaws. The poetic descriptions were beautiful, sometimes a tad lengthy but provided the subject of the book and the character of Maya it was justified to an extent. Maya’s indomitable spirit and courage were contagious and instilled in me a desire to fight back all demons. Yes so true aritri and definitely not unreal ,now and then Maya go through all this taht too unnoticed and without being reported .The pain and agony of underprivileged women of our society needs to be noticed and heard. Many people fail to realise that and think that women enjoy unnecessary privileges. 😒 I don’t know how to make them understand. They don’t know that this is not our privilleges rather our rights which have been opressed since years .I have started writing on this , a draft is already saved.I too feels so strongly about this issue . Thanks a lot dear for your kind gesture on insta.